So I right-clicked on a file and selected "Cut" in the context menu. So that I later could "Paste" the file into another directory. Make so that when you select "Cut" on a file, the icon becomes dimmed. Because right now, there are no visual indication, so you don't know it worked. In Windows there is a visual notification by the icon becoming dimmed. In Ubuntu there is no visual notification, the icon does not become dimmed. This is confusing. But this has been known on GNOME bugzilla since 2001-03-30. I agree, this is a usability issue which is in need of a fix. There is no indication that specific files have been cut from a folder. Upstream do not see this as an important issue but for people switching from Windows it is a major issue as the UI could appear unresponsive as it does not give feedback when a cut operation is performed. Even if files are not dimmed there needs to be some feedback about the cut operation. Is there a way something could be implemented through an Ubuntu-specific plugin? I do agree this is a needed fix. Very good example of a papercut bug. Is this change going to be made for release in 10.04. If it is, could you also add a feedback when files are copied. Has anyone recently tried the patch from the Gnome bug? It likely won't apply cleanly now, but anyone taking on this issue might be able to use it as a starting point. Here's a straightforward mockup of dimmed icons. * Dimming effect is achieved by setting lightness to 100% on icons and/or labels. * Documents folder has dimmed icon, normal label and emblem. * Templates folder has dimmed icon and emblem, normal label. * Ubuntu One folder has dimmed icon, emblem, and label. * Videos folder has dimmed icon, no emblem, normal label. * Pictures folder has dimmed icon and label. I think dimming icon, emblem, label is the most consistent approach. If label lightness cannot be manipulated, we should set the label's status to inactive. Perhaps this dimming effect can be achieved by setting all widgets in the icon container to inactive? Dimming the icon is better than nothing but I think the problem goes a little deeper. What do you do if the user copies, rather than cuts, something? Dim that as well? The dimming doesn't seem to make as much sense for copying. I think this thread: <https://lists.ubuntu.com/archives/ubuntu-devel-discuss/2009-June/008724.html> attests to the fact that there is a deeper usability problem with clipboard and cut, copy and paste. There should be a visualisation (a panel applet, possibly) of the clipboard with the ability to preview its contents. This applet should implement some sort of notification when a cut or copy occurs to show that the content has gone into the clipboard (just like we have an animation when a window is minimised to the panel), and it should be possible to put more than one item in the clipboard. More like the clipboard in Sugar. seanh, I really like your ideas. Initially we could simply have a notification that says something like "10 files copied to clipboard" or "10 files cut to clipboard". Later, a compiz animation of the ghost icons that have been cut/copied could fly to a clipboard in the notification area. The copy and cut could also be differentiated with different sounds. the notification, no text to read. * You cannot see _where_ you cut the files if multiple Nautilus windows are open, easily leading to confusion if you switch between the windows. Dimming does not seem like an optimal solution - the icons will look as if they've simply been selected, rather than cut. I think they should become semi-transparent instead. Moved back so Cody can address next week (and week after). Mat, please see my mockup and provide feedback if it should be changed. I don't think the items looks selected. I think the mockup looks good. Another idea could be to add further emblems to the icons of copied/cut files. In the simplest case this could be the stock icons for copy/cut (usually a pair of documents/a pair of scissors). I’ve quickly created another mockup showing this (based on Daniel‘s above – sorry for hijacking the screenshot …). Probably some design person will find ways to further improve this idea, e.g., by adding some striking background color to the little emblem. Unfortunately I have no idea how easy this would be to implement … maybe the existing emblem infrastructure could be used for this? I find the cut icons very confusing. They exist on different corners of the icons, and they exist on both dimmed icons and non-dimmed icons. The only question I have about David's mockup is how prelight/mouseover affects a dimmed icon. Right now when you mouseover an icon it lightens up a bit, so I guess if you mouseover a dimmed icon then it lightens up some more? When making these decisions, keep in mind that cut files are not supposed to be there anymore. The dimmed representation is merely a trace of where the file used to be, not the file itself. I recommend we do not have a mouseover effect for cut file representations. I love the scissor idea, maybe it could be used in combination with the dimmed effect. I think the mouseover effect is necessary because you can open the file, move it around, until you paste the file in another place and least but not last you could simple change idea. they're merely selected, not "about to disappear from here". Sorry about that. As said, I had just taken David’s mockup. The small emblems are on different corners to try out different possibilities. There is one advantage about my idea that I perhaps failed to make clear enough in my original comment: with different emblems the idea provides for both cut and copy actions (which is not shown in my mockup). Also, there are probably already provisions in Nautilus for handling such emblems; at least there are the default Nautilus emblems which should work similarly. "There is one advantage about my idea that I perhaps failed to make clear enough in my original comment: with different emblems the idea provides for both cut and copy actions (which is not shown in my mockup). Also, there are probably already provisions in Nautilus for handling such emblems; at least there are the default Nautilus emblems which should work similarly." I like that there's an interest in going this direction, but for me I think emblems is not the right approach. There was some talk by Nautilus people before about having a 'shelf' system (which is kind of akin to the 'trash' system in a way) wherein you shelve items that have been copied or cut, and at some point you can view them in the shelf. Conceptually this makes much more sense to me because cut/copied items will always be in the same place, and to find out what "Paste" will yield at any given time is as simple as looking in your shelf. I think dimming an icon that represents a cut icon is important because it indicates, as David said, that this file may soon cease to exist in its present location. I don't think there's really a need to give any indication at all of a copied file in its existing location. When you copy a file, that doesn't affect the file in its original location and it's really only useful to know about copied files when you're in a different location. That said, while I like the shelf idea conceptually.. I also don't have any brilliant ideas about how that might work in terms of a user interface/experience. If someone here comes up with something brilliant, you'll be a hero to many. @Chriki™ : Pls do a better mockup[for cut and for copy], and post it here, it is nice idea, and it would be a shame to scarp the idea , just because people didnt get the idea properly. Has this idea, perhaps, stagnated? Replacing this paper cut within its milestone because it has stagnated. Removing from paper cuts. Cody has shown that this is not trivial (it's a feature). Two years later and we're at Ubuntu 10.04 and this is still an usability issue. 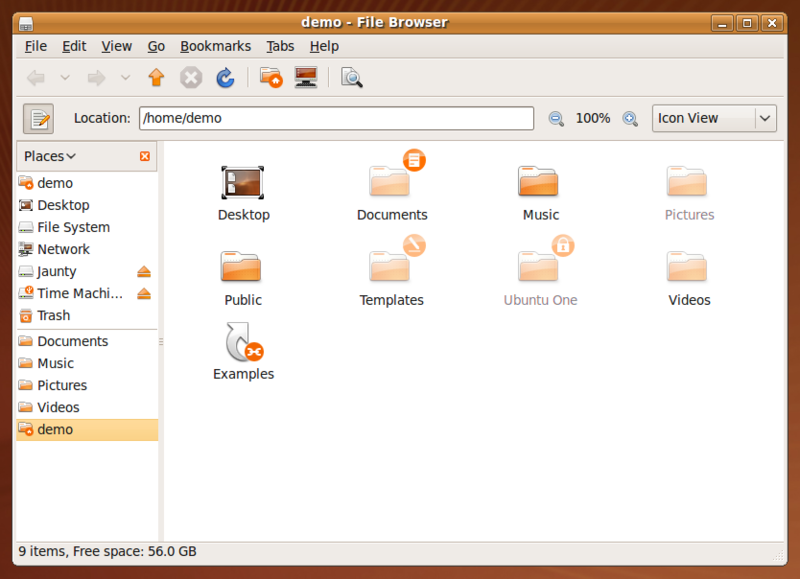 This has now been fixed upstream and will be available in the next Ubuntu release. Can it be fixed for ubuntu 10.04.1 release? > Can it be fixed for ubuntu 10.04.1 release? I can confirm that this has indeed been fixed in Maverick. However, I believe the contrast difference is too low. It is not very noticeable. The effect is too subtle. It could be made more obvious/clearer.